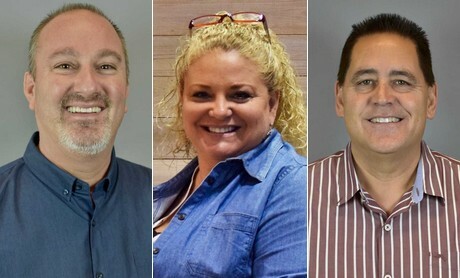 Veg-Fresh has added to its sales force to kick off 2019. Leading the team in a new VP of Sales role is industry veteran Jeff Kelly, who has spent the last 15 years in produce sales management in Southern California. “The VP of Sales role is a new position at Veg-Fresh Farms. It was something we knew we needed as owners, but it was not a position that could be easily filled. Jeff possesses the experience, drive, and team building skills we were specifically looking for, and we are excited to see him grow into this role,” said Dino Cancellieri Jr., general partner of Veg-Fresh Farms. “I’m excited by the opportunities I’ve witnessed at Veg-Fresh, from strong organic and conventional retail programs the team has already built, to the grower partnerships Veg-Fresh has cultivated and sustained, to the foodservice sales that continue to build year over year. I am looking forward to taking the Veg-Fresh sales growth into the next decade.” said Jeff. Jeff Kelly, Cherie Galper, and Mickey Owens. In addition to Jeff’s hire, Veg-Fresh has also added additional sales staff support. Cherie Galper recently joined the team in January and will focus on driving the organic and conventional tomato category forward, while also assisting with Veg-Fresh’s grower relations in the Salinas/Watsonville area. The second hire in January was Mickey Owens, who made the jump to the supplier side after 35 years at Kroger, most recently as a produce buyer. “Cherie’s longstanding relationships with retailers and wholesalers is a bonus for us, and we look forward to seeing her contributions to our team and her implementation of our new product offerings. We are equally excited about the addition of Mickey to our Veg-Fresh team – we have had the pleasure of knowing him for many years, and the perspective he will bring to our sales team will be paramount to our success. His retail buying experience will be absolutely valuable in helping us service our accounts and building programs with our retail customers,” said Dino Cancellieri.